"The electronic standards of conduct or procedure." Digital Etiquette is similar to that of etiquette you learn to succeed in society. It is a set of guidelines that digital users should consider when working with the technological community. It is a set of online manners that are needed to create a safe environment for all users. There are no set specific rules to follow, but guidelines that have subtlely emerged through the use of technology. Digital Etiquette is more difficult to pass down to children as social etiquette that was taught for generations, due to the fact that technology is always expanding and therefore, the digital etiquette is also changing. Without the use of digital etiquette, the internet can become a dangerous place full of negativity. Without these in place, issues such as cyberbullying, (an issue that is a growing problem in teens through social media) will continue to make the internet an unsafe environment for learning. Cyberbullying is when people use electronic technology such as e-mails, text messaging, chats, and social media websites to bully another person. This behavior is aggressive and is often repeated and spread quickly. Bullying includes telling rumors, teasing individuals, issuing threats, using mean words, lying, etc. How is Cyberbullying different than bullying seen in school? Often times, victims of cyberbullying may not even know who the person targeting them is. This adds anonymity. This can lead to more hurtful attacks as with the idea of being unknown, the attacker may be more likely to say or do things that they normally would not. Often, if posted online or through mass texts, the hurtful attack can be viewed not only by the victim, but by a large audience as well. Pictures, and messages can easily be distributed and cause difficulty when tracing back to the attacker. It also makes it difficult to stop because once these attacks are circulated, you cannot just delete the message,post, or picture. Cyberbullying, unlike traditional bullying, can happen at any time, not just when around certain people, or in the school environment. This makes it impossible to just walk away from. It may be viewed time and time again by the victim, each time, causing damage. How can we prevent Cyberbullying and other Etiquette Issues? Everyone in the school community should be aware of Cyberbullying and other issues that arise through the use of technology, including teachers, administrators, and students. 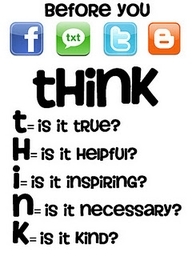 Below are some helpful tips on how to prevent Cyberbullying. Update your school's Acceptable Use Policy (AUP) to include consequences of Cyberbullying. Create procedures to make it easy for students to report cyberbullying. Be a positive role model on acceptable use of technology. Never share any personal information online or through text that can be used against you. Even information to a friend can manage to get into the wrong hands. Be cautious of how you communicate online. Remember tone and sarcasm cannot be picked up through reading, which can lead to information being misread and taken the wrong way. Learn to "walk away" from online conversations that are becoming negative. Over half of adolescents and teens have been bullied online? Only 15% of parents knew that their child was a victim of cyberbullying? More than a quarter of teens have participated in cyberbullying? An article by Mike S. Ribble, Gerald D. Bailey, and Tweed W, Ross discussing appropriate technology use, and strategies on how to encourage students to apply this digital etiquette. An article written by Nick Bilton from The New York Times, discussing how some simple gestures of etiquette are diminishing as technology expands. This article discusses how to implement a Digital Citizenship Program in the school. It includes a Digital Citizenship Audit and scoring guide to better understand the needs of the school. Article discusses similarities and differences of Traditional bullying to Cyberbullying. 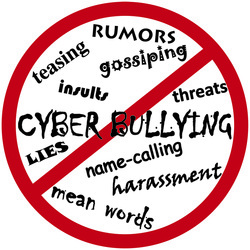 This article discusses what is cyberbullying, along with the effects of cyberbullying. A Free Digital Citizenship Curriculum for grades k-12, including Standard Alignment. This resources includes free classroom activities on various Digital issues, such as cyberbulling, cell phone etiquette, and online etiquette. Website designed based on Mike Ribble's 9 Elements of Digital Citizenship. This website provides research, Articles, activities and other resources. These forms will help Students and Parents understand the expectations of internet use in the classroom. An Article written for Parents to start the conversation on Digital Etiquette, including Cyberbulling. A Short BrainPop Video that students can watch. Also included, are activities and quizzes associated to the video. Take this short quiz to determine if you re a good Cyber Citizen. These pledges are to help understand what is the roles of the parent/child when applying digital citizenship.